If you tried to get here from Buckenham you would be in for a surprise, its on the opposite side of the River Yare! Its a wonderful pub at the end of an unmade lane from the tiny village of Claxston, most people arrive by boat. My pint of Wherry was in good order and the food looked good. A great place to while away an hour or two watching the boats go by. We love this pub! It's laid-back, relaxed, friendly, fantastic location right on the river and passing boats moor up for a pint or a meal. There's a small yacht club right next to the pub, so this is a boat lover's dream spot. In summer it's fab outside; in winter there are roaring fires and cosiness. The food is good, wholesome pub food (none of that gourmet pub nonsense) at good prices and helpings, from sandwiches to full meals and specials, and Sundays they do a great carvery. Usually, the barman is Pete. Or Pete. So you're safe, either way, be it Big Pete or Little Pete! The place has a lovely old-fashioned, slightly worn feel, but it's home from home. Large pub in the middle of nowhere with riverside location. Has its own moorings. In new ownership since March so no idea what it was like before. Smallish outside seating area. 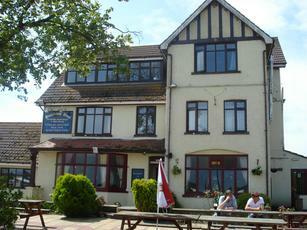 The pub itself is attractive and has been recently redecorated. Good choice of real ales including Caledonian's Lemonale - which is an aquired taste and one I haven't acquired.